VERSATILE WORKSTATION – Use this stand as a mobile stand-up computer desk, lectern, podium or a presentation cart to stage your laptop and projector. Tilting desktop allows multiple angle adjustments. HEIGHT ADJUSTABLE – This ergonomic mobile stand up desk is height adjustable from 40.5 inches to 49.1 inches. Transition from sitting to standing position by adjusting the rotary knobs and manually lifting the top platform. AMPLE ROOM - Rolling presentation cart has a wide top platform to store a laptop, projector or other presentation materials. Secondary platform can be used for storing office and presentation essentials. PORTABLE - Moving the desk from room to room is easy with the 1.5 inch furniture casters, and the desk locks into place with two locking brakes. 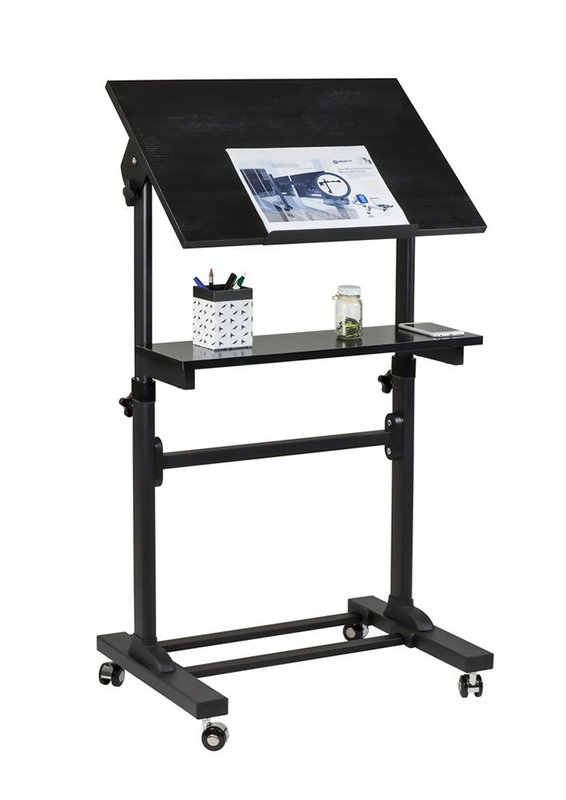 HEAVY-DUTY – Presentation cart has a weight capacity of 88 lbs. Made from sturdy steel frame and E1 grade particle board.